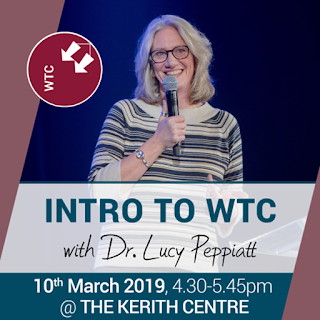 On Sunday Dr. Lucy Peppiatt, the Principal of Westminster Theological Centre (WTC), is going to be speaking with us at all our meetings in Bracknell and Sandhurst (Kerith Windsor will hear her a week later on Sunday 17th March). From September we are going to be hosting a WTC hub in Bracknell, which will allow anyone on a part time basis to study theology at a every level from a Certificate in Higher Education all the way through to a Masters Degree. I’m passionate that as a community we become better equipped theologically, and my hope is that a number of of us will take this opportunity to deepen our understanding of the Bible and how to apply it. We also want to offer these courses as a resource to other local churches. As an aside we’re also going to relaunch what used to be called Invest, which will be a two year theology course run termly on a Monday evening which academically will be closer to GCSE level. This will be accredited by Moorlands Bible College, and I hope will be a great route to a whole load of us getting better equipped theologically. More details on this coming soon. On Sunday we’re hosting an open afternoon at 4.30pm in K2 on our Bracknell site where leaders from other churches can come along, meet Lucy and hear more about WTC. If you know any leaders of other local churches please pass this invite to them. However, it struck me that as well as for leaders of other churches it might also be a very helpful afternoon for anyone in our community who thinks they might want to get a qualification with WTC and would like to hear me, so if that’s you please consider yourself invited! If you can register in advance that would be helpful, but if not just turn up. We’ll be talking more about all of this over the coming months, including at the Bracknell and Windsor vision nights next Tuesday and Wednesday nights respectively. On Sunday 24th March we’ve been asked to host the Radio 4 Sunday Service from the Kerith Centre. This is a service which gets broadcast live every Sunday from 8.10-8.50am, to an audience of well over a million people. It’s going to be part of a series looking at the different things Jesus says from the cross. Our week is going to focus on the conversation Jesus has with the thief on the cross, and will focus on the work of the church with those in prison and seeking to integrate back into life after prison. We’re hoping that Lee and Sonia Brett who head up our prison ministry will get to speak, along with a story from someone they have worked with, and a message from Paul Cowley who heads up prison Alpha. In order to give the meeting a live feel to it, the producers would like us to have at least 100 people in the congregation. That will mean getting to the Kerith Centre for 7.40am in order for us all to be ready to start at 8.10am. If you’re able to come then please do! It would really help us if you could register here so we know you are coming - but if for some reason you can’t register, or at the last minute you decide to come, then please come anyway - we’d love to have you. We’ll provide tea, coffee and pastries for all who make it! Whether you can make it or not please be praying that God will powerful use this opportunity for his message of hope to be clearly proclaimed, and for people to hear a different expression of church to one they may have previously experienced. In a couple of weeks time we’re going to have vision meetings for our Bracknell and Windsor sites. The Bracknell evening is on Tuesday 12th March starting at 7.30pm in the Kerith Centre. There are a number of things we want to talk about including news from across our sites, changes to the way we do small groups in Kerith, an update on proposed improvements to our Bracknell site infrastructure, news about the theology hub we’re going to host from September and much more! We’ll also have space to pray together during the evening. The Windsor evening is on Wednesday 13th March starting at 7.30pm in the Gospel Hall in Dedworth. It’s now six months since we started meeting in Windsor and there is much to celebrate and reflect on (including the homeless shelter we’ve helped to host), as well as looking forward to how things like the new small groups structure and theology hub will impact Windsor. We’ll make an audio recording of both meetings available for anyone who can’t be there on the night. We aren’t doing a vision night for Sandhurst as we had one in January to announce the move to Farnborough and the rename to Kerith Blackwater Valley. We’ll look to schedule one for West Wight later this year. These evenings are a great opportunity for us to come together as sites, hear some of the vision of where we are going, and think about how each of us can play our part in what God is doing in and through us. Help to see you there! As a community we are about to witness the end of an era as Ben Davies, who lead our church from 1964 through to 2007, prepares to move back to his beloved Wales. Ben has been a huge part of so the lives of so many of us, and we as a church simply wouldn’t exist in our current form if it wasn’t for Ben and his decades of inspirational and courageous leadership. We are having an evening to say goodbye to Ben on Sunday 3rd March at 6pm in the Kerith Centre. Everyone is invited to come and be a part of what will be a very special moment in the life of our church. The evening will start with a time of worship, where as part of our worship we’ll sing a couple of songs Ben has chosen. I’m then going to interview Ben, giving him a chance to reflect on his time in Bracknell, as well as telling us about some of his plans as he moves back to Wales. We’ll then make time to pray for Ben, after which he’ll have an opportunity to speak. After the meeting we’ll serve tea, coffee and cakes, which will give everyone the opportunity for a chat with Ben. I know that many of us will want to share with Ben the impact he has had on our lives, as well as thanking him, bringing prophetic thoughts, prayers and scriptures. We’ll have a book where all these things can be written for Ben to read afterwards, or you can email them to the Kerith Centre reception either before or after the evening and we’ll make sure they get to Ben. Parking will be at the college car park for everyone other than the elderly, disabled or women coming on their own. Hope to see you there, and if you can’t make it then email in you memories, thanks or prayers and we’ll pass them all on to Ben.